I have just arrived back in Glasgow after a long but exhilarating day recording with the Tideswell Male Voice Choir for their CD of this Summer’s performances. I know that I will have many long train journeys to contend with in the future so it is a good job that I find it easy to occupy my time or catch a little sleep if I need to 🙂 Coming from a family who work in transport coping with these trips feels quite normal. It was a beautiful church and I thoroughly enjoyed performing there again this year. It was made even more special by seeing some old friends again and meeting new ones. Here I am with Maurice Hargreaves, Malcolm Ross, Margaret Richie, John Richie and Martin Crookall. 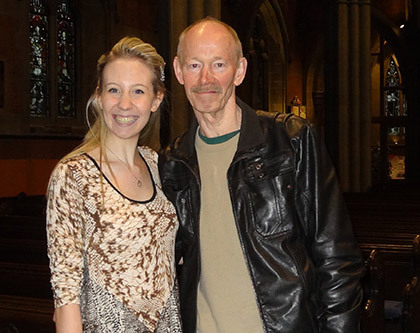 I have known Maurice since performing in local Music Festivals where he worked as a volunteer steward and has been a keen supporter and always encouraged me to continue with my training. I first met John and his wife Margaret when I competed in the Hazel Grove music festival which he coordinated for many years. It was great to see them in the audience. Here I am with Michael Ross. Michael came to several of my recitals last year and I appreciate the distance he travels to come and listen to my performances. After missing Martin at the concert in Stockport that he came to watch last October I was pleased that this time I got to meet him. I would also like to thank everyone who has been kind enough to vote for me on my Artist Signal page. All five of my songs have been listed in the top 52 most played tracks this month with “Amor Commanda” making it to number 26. Thanks for the update. I’m still watching, still listening and still voting. I’ve seen that you have thank you very much 🙂 I think people think that if they like my facebook link that is a vote for me, if my likes had been added from the three links I gave on facebook, I’d have got about 11000 votes more. It’s been a really interesting project and gave me lots more people to share my music with. I think I’ll put another video on the updates if I can. We’ll welcome a new video if/when you can get round to it. Congratulations on entering the ArtistSignal Top-100 Ranks this morning. That’s a great position to be in after such a short time. You must be very pleased. Having joined after the beginning of the month, you have had to play catch-up and that’s not easy. Perhaps March will make a big difference. It has been wonderful to see the support that people like you haven given me on the site. I love to sing and I am having an absolutely fantastic time at the RCS. Working with so many great teachers is helping me hugely. It will definitely be worth it in the end. And a pleasure to meet you too, Charlotte. Even to one as musically illiterate as I, your talent was obvious. Thanks Martin 😉 it was a bit chilly in the church wasn’t it I’m going to wear my thermals next time. How nice it must be to sing in such beautiful spaces! Hi Ellen one of the reasons I love to do lunchtime recitals is the pure joy of singing in these beautiful churches, the acoustics really are phenomenal you don’t need microphones and sound equipment it’s just you and the piano or Elizabeth’s beautiful flute playing. Reblogged this on Melody Music Studios. Lovely place. I’ll bet your voice filled the church with joy. My friend Gill said that our flute ensemble was haunting and she had a good chuckle at ‘The Laird O’ Cockpen’ and we had a lovely round of applause at the end. Would love to be there sometime. A lovely background for your music for sure. Must be inspiring. It was a great afternoon and a lovely opportunity to sing in a beautiful church. I wish you all the very best 2014. I would like to invite you to visit my blog http://www.lifeislifeis.wordpress.com. I am fairly new to blogging and would love to have any feedback that you may have. Hi Ramesh, I checked out your blog and I will call back and visit again soon. Drop by for visit again if you get the time. Thanks much for visiting my blog too. Wow..the first photo interior reminded me of the rococo style I learned about in art history..but without the pastel colors. I know Eric, Gill took some great photos and video for me to review. We have some wonderful heritage buildings in the UK. Great photos Charlotte, and here’s to another great week! Thank you 😉 I’ve had a day full of lectures and improv today but I’ve planned in a day’s quiet study and rest, I’m learning to pace myself better. I took advantage of being at home to have a lounging day on Saturday; I did absolutely nothing but watch films and sleep. The majority of photos of me when I was little were with a big cheesy grin I guess I was in training from about three months lol. What a beautiful venue! Sounds like it was a great evening. It was a lunchtime recital, every Friday lunchtime Bury Parish Church puts on a music program from September to July. It is a beautiful venue. Hi Iris, I do have some wonderful opportunities you’re right and I grab them with both hands. I try to be careful with bookings in term time and I always get permission from the Royal Conservatoire of Scotland because they are very careful to ensure their vocal trainees build their training with a healthy voice. I would like to try to arrange some more summer opportunities though so that I can concentrate on my music this summer rather than working all of the holiday break in the office. I have to master French next year which will be completely new for me so I could do with a month off to work on that. Sounds like an amazing experience! Thanks for sharing! Thanks Kristen, loved looking at your pictures of Cortona brought back good memories, I’ll check out your site later when I have more time 😉 You can see our Italian adventure in the June 2013 archives, absolutely beautiful country. Enjoy yourself. Absolutely love this post! So original! Can’t wait to read the next post! Thank you Dianne 😉 I love your support and encouragement. Stunning venue, good to see your friends. It’s a shame my friend Gill wasn’t on the photos too but she was taking them and video recordings for me to review. I was able to send my French recording to Pascal and he’s advising me on vowel pronunciation as I tend to lean towards the Italian pronunciation, I’ve never studied French so it’s a challenge. Congratulations on entering the top 100 in Artissignal top and entering in top 10 in Classical section. Hi Cristian, mulțumesc mult. I didn’t know I was in the top 10 in the Classical section, that’s great. I would like to learn a Romanian folk song this summer; do you know any suitable for my voice? Is a very nice surprise to see romanian words in your message. I send to you two youtube link. First is one with one of greates romanian folk singer Maria Tanase: http://youtu.be/_abvpWeHlt8 (title is “who loves and leaves” (the loved one)). Antoher one is “Ciobanas cu 300 de oi” (Shepard with 300 sheep). I send you 2 link. I hope this could helped. Anyway you can search on youtube song interpretated by Maria Tanase or Ioana Radu. I don’t know why, but the answer with some links did not apear here. So I try again. Damn, every time I stop back here you have another performance under your belt and great pictures to boot. One of these days, once I’ve posted more, I’m going to have to have you do a guest post! How’d you get so good at the balancing act? 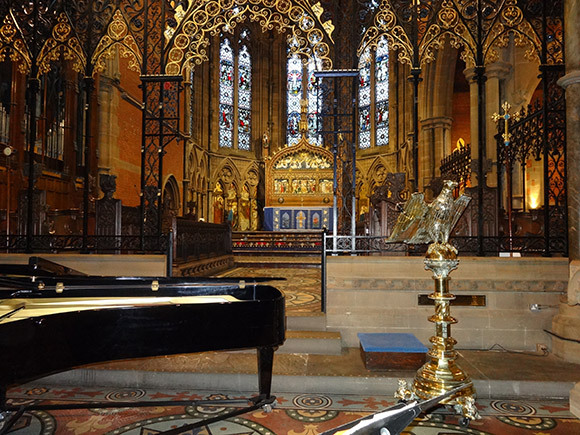 My next concert is with the RCS chamber choir on the 19th March at Paisley Abbey with all of the singers from my year, I’m really looking forward to it, then I have two recitals booked in April. I’ve been offered a relief role in the opera chorus, my first opera performance, which is very exciting and I’ll blog about soon and some big concerts with the Tideswell Male Voice Choir this year. I’ve always been a busy girl, my family are busy people it’s all I’ve known, even on holiday we spend the time exploring, walking and adventures. Since “epic” is your new favorite word, I hope your weekend was an epic one, especially your recital. The opportunity to participate in a recording session must have been an exciting one. Whenever I’ve done a session, the songs I’ve done are in the head for a few days.